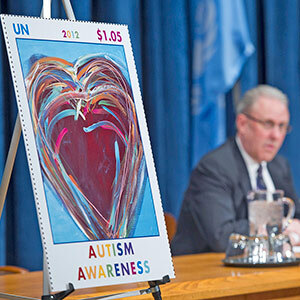 Throughout its history, the United Nations family has celebrated diversity and promoted the rights and well-being of persons with disabilities, including learning differences and developmental disabilities. In 2008, the Convention on the Rights of Persons with Disabilities entered into force, reaffirming the fundamental principle of universal human rights for all. Its purpose is to promote, protect and ensure the full and equal enjoyment of all human rights and fundamental freedoms by all persons with disabilities, and to promote respect for their inherent dignity. It is a vital tool to foster an inclusive and caring society for all and to ensure that all children and adults with autism can lead full and meaningful lives. Autism is a lifelong neurological condition that manifests during early childhood, irrespective of gender, race or socio-economic status. The term Autism Spectrum refers to a range of characteristics. Appropriate support, accommodation and acceptance of this neurological variation allow those on the Spectrum to enjoy equal opportunity, and full and effective participation in society. The stigmatization and discrimination associated with neurological differences remain substantial obstacles to diagnosis and therapies, an issue that must be addressed by both public policy-makers in developing nations, as well as donor countries.